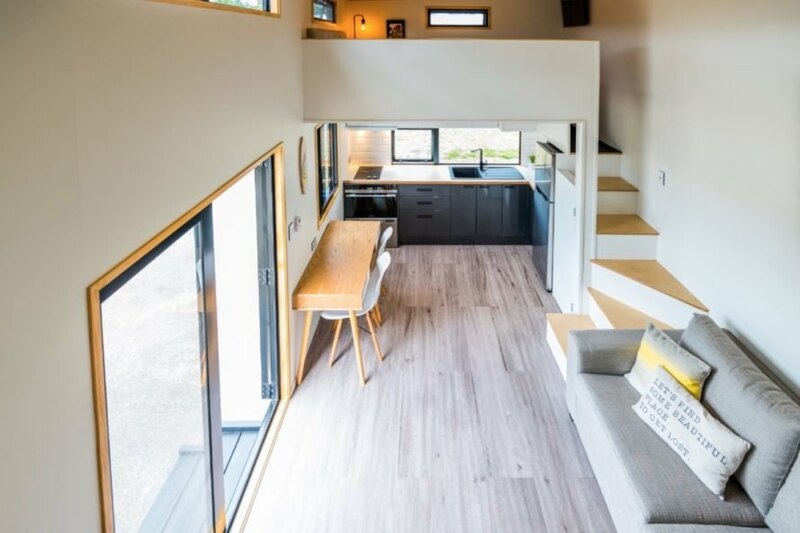 The notion of living large in small spaces is perfectly captured in the Pohutukawa, a tiny home on wheels that fits up to six people and boasts a double mezzanine. 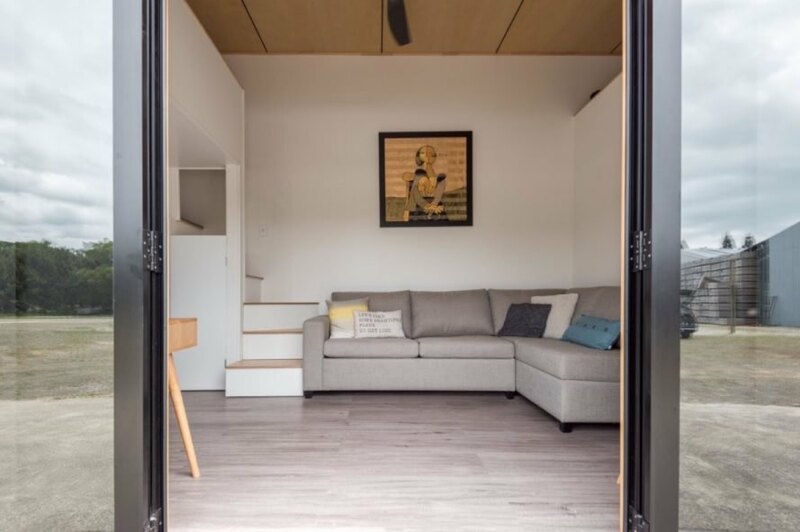 Designed by New Zealand-based firm Tiny House Builders, the contemporary Pohutukawa is a luxury tiny house that comes with a fully outfitted interior and all the necessary hookups. 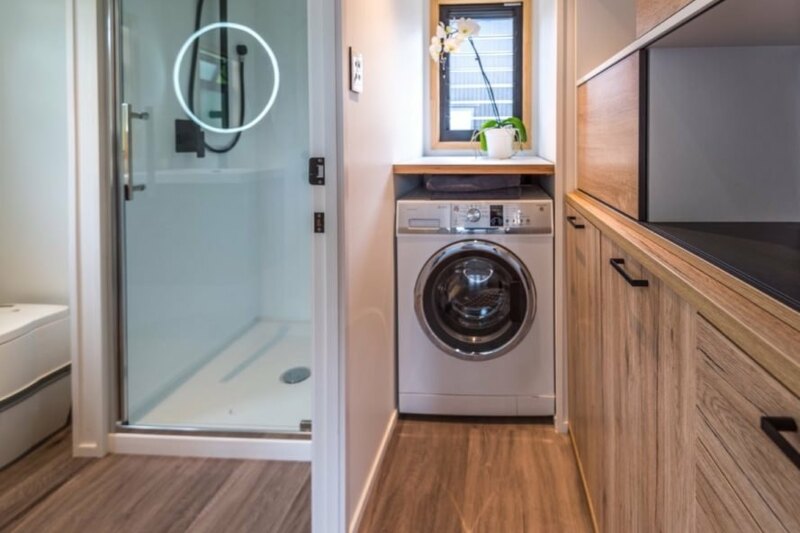 Keep scrolling to take a peek inside the surprisingly spacious tiny home. Outfitted with all the modern comforts of home, the Pohutukawa measures nearly 10 feet in width and 27 feet in height with an 11.5-foot-tall ceiling. The Pohutukawa, which takes its name from the New Zealand Christmas Tree, is handsomely clad in board and batten siding painted black, which contrasts sharply with its light-filled interior and white walls. With a footprint of approximately 270 square feet, the abode also embraces indoor-outdoor living for an even more spacious feel thanks to aluminum-framed French doors, while clerestory windows and other wide windows — all double-glazed — let in additional natural light. The mono-pitched roof is topped with corrugated iron. 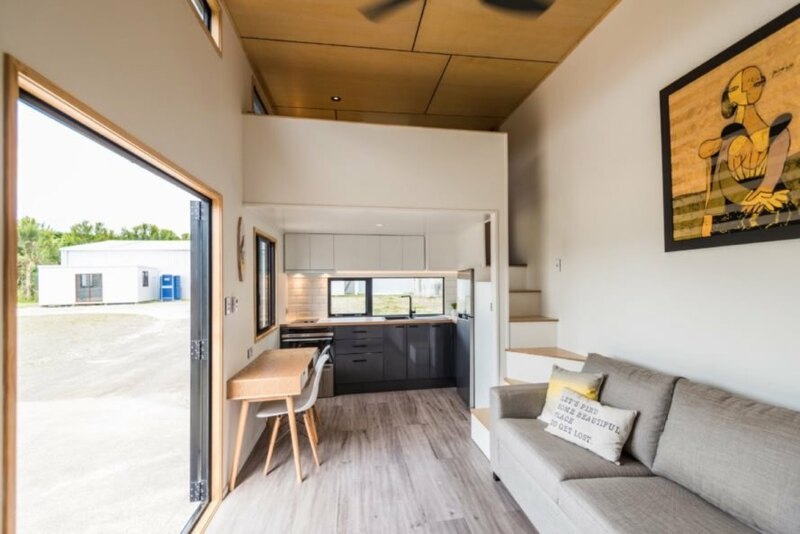 The home rests on a custom-made triple-axle tiny house trailer. At the heart of the home, there is a large living and dining area with a mezzanine on either side. Beneath the first mezzanine, which fits a queen-size bed, the full kitchen includes a dish drawer, an oven/microwave, hob, range hood, sink, fridge/freezer and plenty of storage. 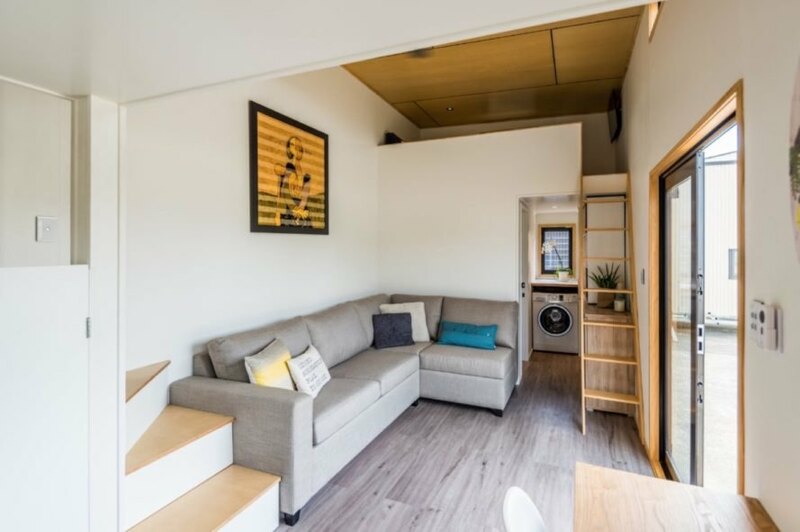 On the other side of the tiny home is the more compact mezzanine that can hold a double bed or serve as an entertainment lounge and is accessible via ladder. Beneath that elevated space is the bathroom with a standing shower, vanity, toilet and heated towel rail. The washing machine and extra storage can also be found on this side of the house. The price of the Pohutukawa tiny house ranges between $55,000 USD to more than $90,000 USD. The structure typically takes three to four months to construct from start to finish. 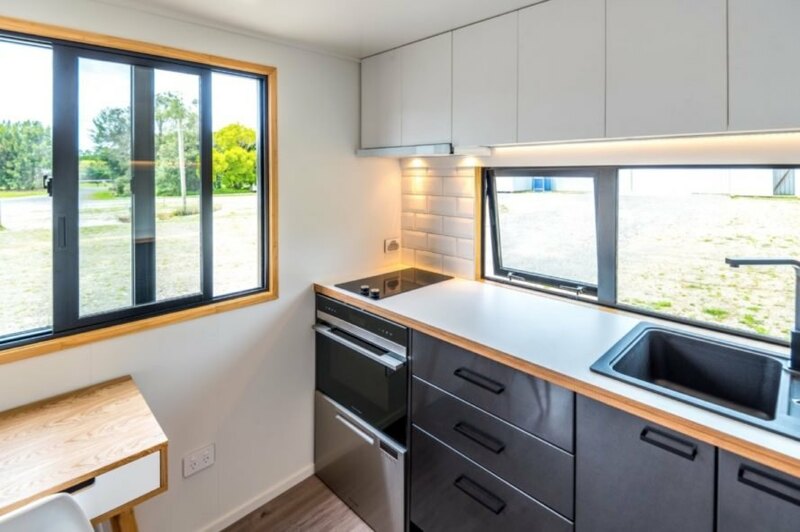 The Pohutukawa includes appliances, but clients can also purchase optional upgrades, from a custom corner fold-out couch with built-in storage to an off-grid solar setup. The tiny home is clad in board and batten siding painted black. The home opens up through glazed French doors. 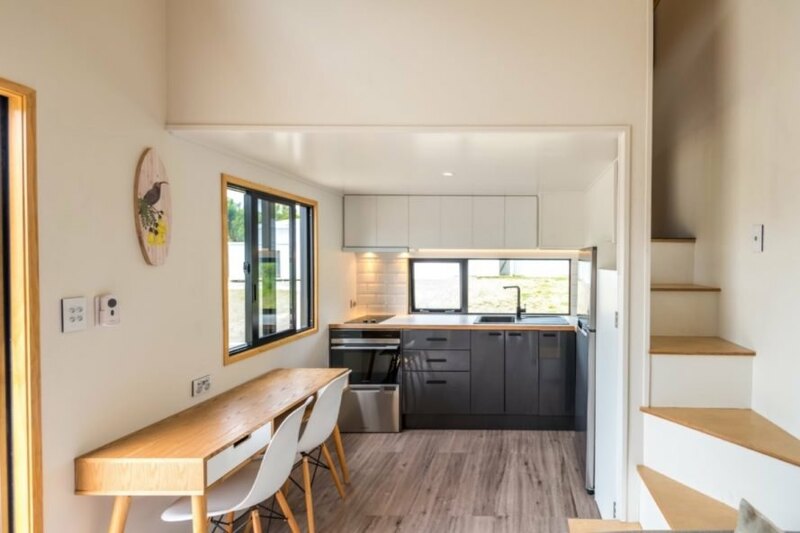 Natural light pours into the tiny home to lend a sense of spaciousness. The dining area is between the kitchen and living room, in an open-floor plan. The kitchen has a dish rack and oven/microwave, among other appliances. A wide window lets in plenty of light to the kitchen. The kitchen is under the bedroom space. Clients can choose to add a custom couch with built-in storage. The compact bathroom has a full shower. The tiny house comes with plenty of storage. The first mezzanine can hold a queen-size bed. Easy access stairs lead up to the primary mezzanine.